As a former Welsh Youth cap, Rob recognizes the contribution rugby, Aberystwyth Rugby Club, and being a member of a team, played not only in the development of his rugby skills but also in the formation of his strong character and his determination to succeed in whatever field of play. As a mark of appreciation, Rob has sponsored the Aberystwyth Rugby Club Youth Team for many years and recently sponsored a complete new team kit. He is extremely proud of the achievements of Aberystwyth RFC and is a regular touchline supporter. Both, Rob and Sheila, are former Young Farmers Club members and take an active role in supporting the work of the YFC movement. It was through the YFC movement that Rob was initially introduced to stockjudging and feels it is a skill that enrichens the knowledge of every stockman in identifying quality stock and expressing their reasons for doing so, giving them the confidence to stand behind their judgement. It has given him great pleasure in recent years to see the next generation succeed at both county and Wales level. We always support of the RNLI in Aberystwyth and have even participated in the Glengower Charity Raft Race. The “Butchers Boys” launched their own hand-crafted raft and an audience of several hundred spectators, saw our very own coxswain and experienced rower, Gwilym Jones, lead the team to disaster, when the heavily laden raft collapsed within 10 yards of leaving the shore.!! 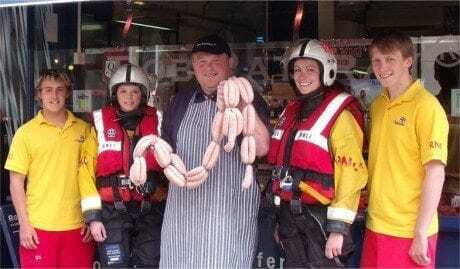 A lot of fun and all in aid of the RNLI. 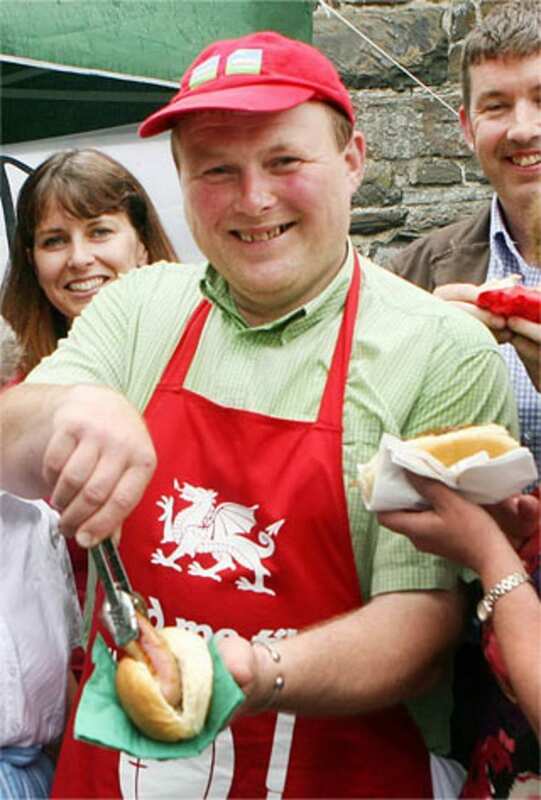 When the Urdd National Eisteddfod visited Ceredigion we created the ‘Mr Urdd’, green, white and red sausage to celebrate. It was a product that grabbed the interest of the children, raised their awareness and knowledge of the product they eat, and these have since grown to be one of our most popular sausage. As avid rugby fans, we regularly make the ‘Six Nations’ sausage during the Six Nation Tournament as a tasty treat for hungry rugby fans. The entire family are former pupils of Llanfihangel y Creuddyn School and Rob takes pride in seeing the schoolchildren participating at sporting festivals wearing the Rob Rattray sponsored kit. During a fabulous day of celebrations to mark the schools 175th birthday in 2013 we could proudly trace the family connection back to its origin in 1838, spanning 8 generations of Sheila’s family having attended. A very comprehensive 130 page book recording the full history of the school was published. 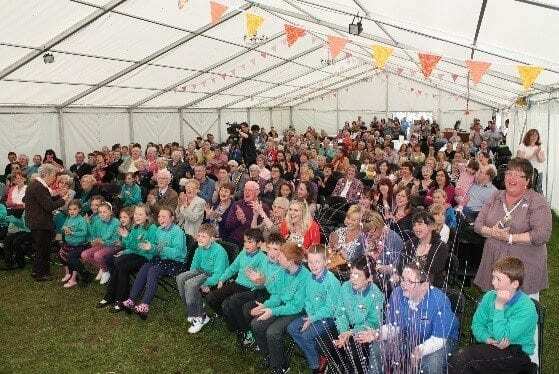 We proudly support a wide range of local activities, far too numerous to list. 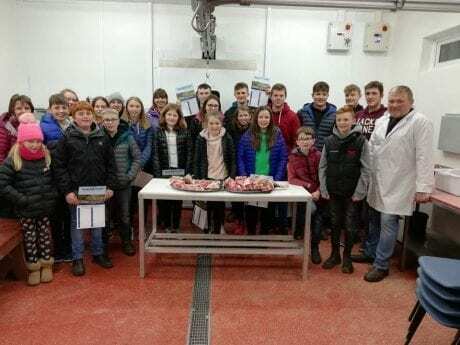 we often host Carcase Cutting Demonstration for groups, including YFC; WI; Merched y Wawr; Discussion Groups; Grassland Societies; and Farm Women’s Clubs at the Butchery Unit. Rob demonstrates cutting up a lamb, pork or beef carcase and discusses the various joints available. For groups of farmers, he will explain the virtues of each carcass and explains what he seeks in an ideal carcass. he feels, this gives, the producer an insight into the desired end-product enabling them to produce the ideal carcase for the butchers market.